Whether you're interested in the religion or the spirituality, the culture or the ethnic traditions, Judaism For Dummies explores the full spectrum of Judaism, dipping into the mystical, meditative, and spiritual depth of the faith and the practice. In this warm and welcoming book, you'll find coverage of: Orthodox Jews and breakaway denominations; Judaism as a daily practice; the food and fabric of Judaism; Jewish wedding ceremonies; celebrations and holy days; 4,000 years of pain, sadness, triumph, and joy; great Jewish thinkers and historical celebrities; and much more. Jews have long spread out to the corners of the world, so there are significant Jewish communities on many continents. 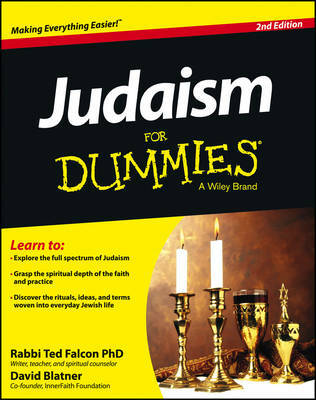 Judaism For Dummies offers a glimpse into the rituals, ideas, and terms that are woven into the history and everyday lives of Jewish people as near as our own neighborhoods and as far-reaching as across the world.